We were pleased to welcome John and Susan Sharman tonight who were blessed with a warm SSW breeze which was ideal for the A rig. We managed our customary eight races and thanks to Chris C we varied the course which kept everyone on their toes – give or take the occasional diversions. 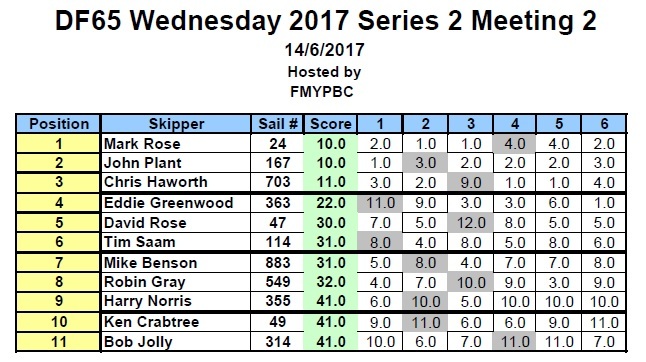 As you will see from the results Mark was victorious in probably the closest racing of the season so far. A very good turnout deserved better wind, 5/6mph dropping all the time. We adopted the same course as the DF95s on the previous evening but only one lap per race. After six races we’d had enough so packed it in. Would you believe it, twenty minutes later the wind had picked up again but too late!. It was a close run thing for the first three places and even closer for the last three!